After working for way too many hours in a row our first mooring operation was finished last night. We successfully retrieved our S2 mooring, which has been active for two years since last service. There was some minor drama, but all worked out good in the end. We had partial ice cover and the ADCP buoy got stuck in some ice, but was freed using the Zodiac. 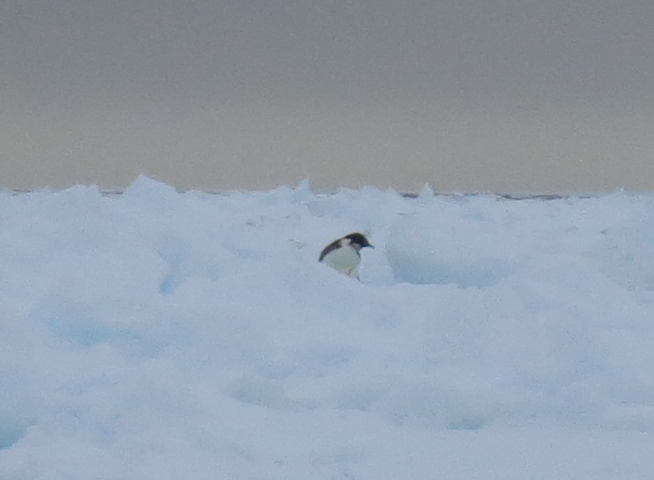 During this procedure we were observed by a lone Emperor penguin close by. But the biggest stress was the fact we did not get any response from one of the releasers, which recieves our signal to release the rig from the bottom weight. This is why you have two releasers, and not just one, and luckily the second one responded. Having both releasers failing may be the worst thing imaginable (except of course for bodily harm), all gear and data forever lost on the bottom of the ocean. Our tech wizard Johan has worked on the releaser today and it seems to be in working order now. Now we are in the Amundsen polynya and the rest of our stations will be in this ice free area, so recoveries will hopefully run smoothly. A polynya is an area in the ice that will melt and be ice-free every summer season, due to the supplied heat from winds (sensible heat polynya) or ocean currents (latent heat polynya). The Amundsen polynya is like most Antarctic polynyas of the latent heat kind. Hoping this info is correct, no textbooks or Wikipedia available now, only my brain to trust, which may not be so reliable at the moment considering the amount of sleep recently. Speaking of which, time to hit the sack now before next shift begins. Congratulations to this first success! Spännande att höra att det går bra! Ska bli kul att se bilderna också så småningom. Bra bloggande där, kompis! Hur kommer det sig, nu igen, varför inte isbjörnar äter pingviner? I am an oceanographer and phd-student at the University of Gothenburg. My research is focused on the ocean circulation in the Amundsen Sea, West Antarctica.